Thank you for visiting another one of Buckeye Motor Sales's online listings! 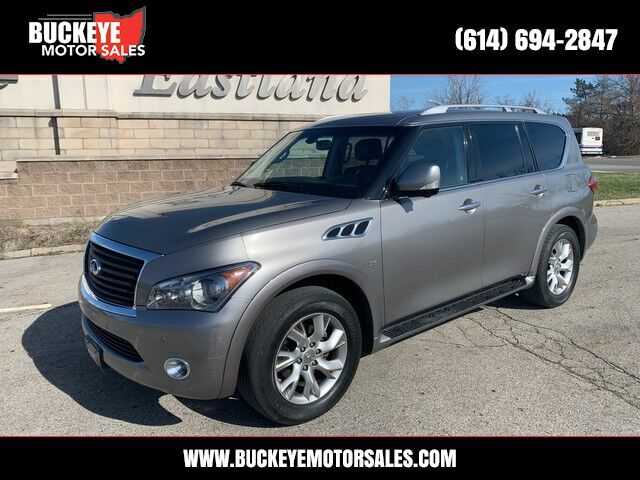 Please continue for more information on this 2014 INFINITI QX80 Utility 4D 2WD V8 with 69,306mi. Outstanding craftsmanship and artisanal refinements abound with this INFINITI QX80 Utility 4D 2WD V8. It's not a misprint. And the odometer isn't broken. This is a very low mileage INFINITI QX80. A rare find these days. The INFINITI QX80 Utility 4D 2WD V8 is in a class on its own. So much so, that INFINITI didn't miss a beat when they loaded this vehicle with an abundance of a-la-carte options. You'll see the world in a whole new way thanks to the navigation system that comes with this vehicle. Amazing wheels help set this INFINITI QX80 apart from other vehicles like it. The QX80 is a large luxury truck that is both elegant and comfortable, yet its body-on-frame layout allows a tow rating of up to 8,500 pounds. Ride comfort and handling are also quite good and the big 5.6L V8 and 7-speed automatic make an agreeable pair with strong responsiveness. Three rows of seating accommodate up to eight passengers, which makes the QX80 a good pick for families. Inside, the cabin is a standout, with a quiet, refined feel, lots of standard and available technology and great ride quality.